When the Cayenne was unveiled more than a decade ago, the automobile world, especially Porsche fans were shocked to see an SUV roll out of Liepzig. After all, one doesn't expect a sportscar maker to start manufacturing a mammoth five-door car all of a sudden. But what seemed like a gamble then actually turned out to be a runaway success. 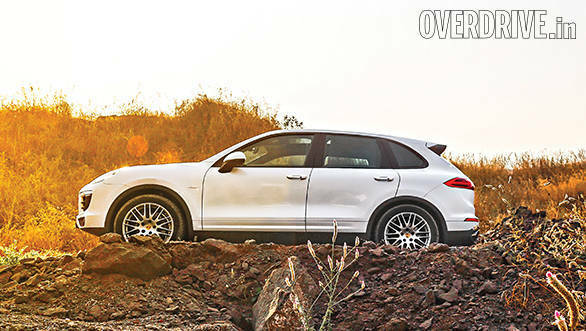 As of today, Porsche has sold more than six lakh units of the Cayenne! A remarkable feat indeed - this makes it one of the most successful luxury SUVs of all time. India too has contributed to this number - one does see quite a few of them on our roads today. Well, it is indeed one of the few Porsches that can handle our broken roads and speed breakers. 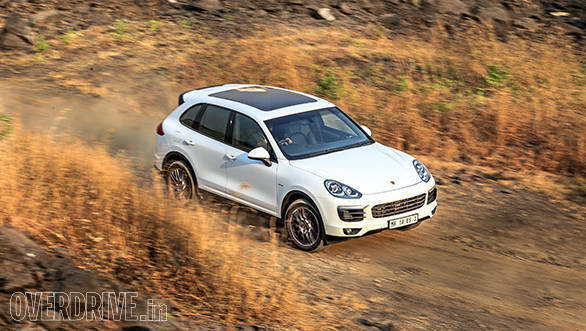 Now, Porsche India recently launched its second SUV, the smaller Macan but priced it higher than the Cayenne diesel, as a result making it less practical. But this wasn't going to be the case for long. A new Cayenne has just gone on sale and now costs more. Read on to find out what's new and if it still is the most sensible Porsche SUV to buy today? The Cayenne gets sharper with every update and it's no different this time. The silhouette remains the same but there are quite a few changes. The front end for instance gets revised styling and new headlamps with signature four-point daylight running lamps. The face looks more powerful and we like it. The sides are the same and only if you look closer will you realise that the indicators have moved to the side mirror housing. The rear spoiler now flows along the roofline instead of the earlier stepped approach. Wheels are similar - the ones you see here are the optional multi-spoke 20-inch design that was offered before. The rear has been redesigned and goes well with the front-end. The most prominent change is in the redesigned LED tail lamps that feature four-point brake lamps. Twin-exhausts are now standard on all models and add to the sporty character. Inside, the steering wheel is all-new and since it is based on the design found in the 918 Spyder wheel, is great to grip. The paddle-shifters are placed well and are a delight to use too. 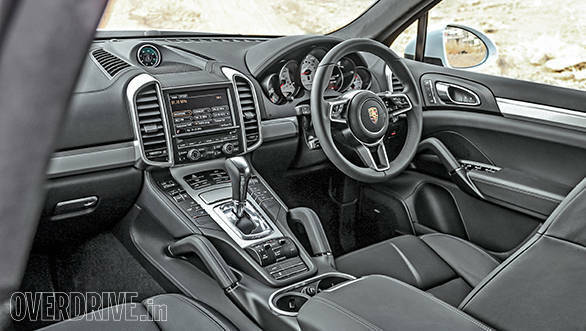 The rest of the interior is similar, so the centre console still rises up to the front and the multi-pot instrument cluster is so 911-like. Attention to detail is very impressive while high quality metal accents are fitted superbly. While the international Cayenne gets an updated 3.0-litre V6 common-rail diesel, the Indian spec doesn't. Power output then remains the same, maximum power of 245PS is produced from 3,800rpm to 4,400rpm while peak torque of 550Nm is available from as low as 1,750rpm up to 2,750rpm. On the road, power delivery is linear and strong, making it ideal for town, off-road as well as highway use. There won't be a PDK transmission on offer since the 8-speed Tiptronic S transmission is better suited for off-road applications. It surprisingly offers quick shifts and features a wide ratio spread to make use of all that torque. Performance hasn't improved but is still very impressive considering the sheer size of the vehicle - 100kmph comes up in 7.7 seconds when Sport mode is turned on (just 0.1s slower than the claimed figure). 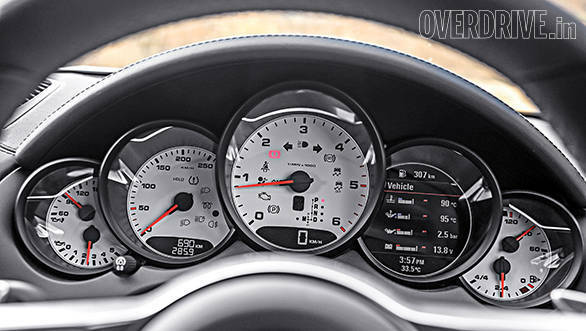 One can also opt for the Sport Chrono package for slightly better acceleration. This may be the slowest Cayenne variant around but it is also the most efficient. An overall efficiency of 11kmpl means you can drive over 900km on a full tank. The Cayenne is arguably one of the best handling SUVs today. Get behind the wheel and the eagerness and grip is almost sportscar like. All this from a vehicle that weighs more than 2 tonnes. The diesel now even comes with active suspension and this is one of the key reasons for sharper handling. In Comfort mode, the ride is plush and body-roll, though present, is quite acceptable. The SUV can drive through deep potholes and broken roads and you can still probably sit in the backseat (that's a lot more comfortable now) and sip coffee without spillage. 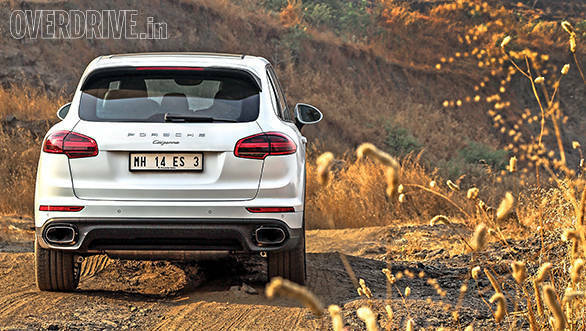 In the Sport mode, one can still drive the Cayenne on almost any bad stretch in India. The third mode, Sport Plus is for the enthusiast in you - the SUV gets lower and there is almost no body roll. The steering, chassis and suspension understand each other best in this mode. Air suspension is standard now, so one can increase and decrease suspension travel based on the situation. Six ride heights are on offer, the lowest level offering 158mm of ground clearance while the highest, an impressive 268mm. A lowerable load sill has also been added since the vehicle features air suspension. Just press a button and the luggage compartment lowers the level by a further 52mm. 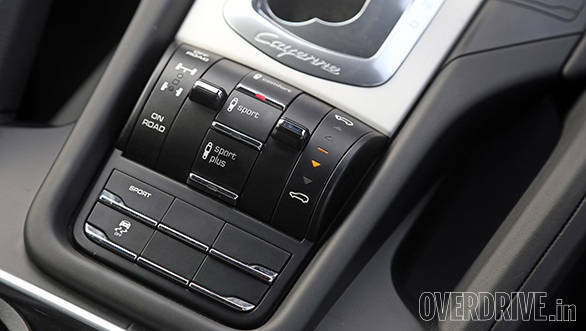 The Cayenne is now feature loaded with most optional equipment now being offered as standard. It even looks fresh and is in sync with the other new Porsches. The ability to offer sportscar like handling and enough clearance to go through most off-road terrain in luxury makes the Cayenne a very unique offering. 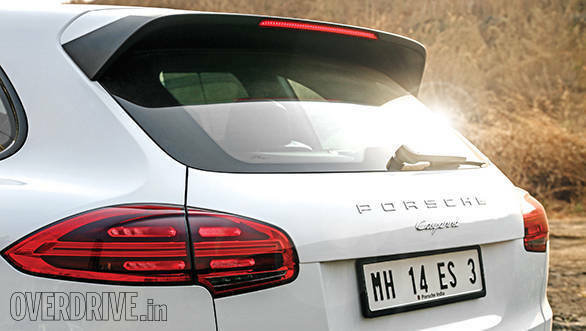 Priced at `1.02 crore, ex-showroom Maharashtra, the Cayenne diesel is now a few lakhs more expensive than the smaller Macan but is still the most practical Porsche for India today.